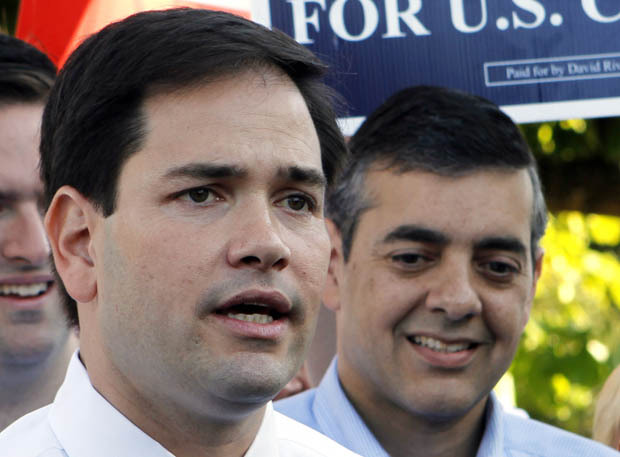 Florida U.S. Sen. Marco Rubio campaigning for embattled Rep. David Rivera in 2010. Rivera is being investigated for allegedly running a shadow campaign in his quest for reelection. Paul Ryan may not have provided much of a bump to Mitt Romney’s presidential campaign anywhere but in Wisconsin, but as the headlines popped up in South Florida late Wednesday, you know he’s gotta be feeling some relief that he didn’t go with Sen. Marco Rubio. That’s right: It appears that Rivera — for whom Rubio held a fundraiser as late as May 16 of this year, and with whom he co-owned a house that went into foreclosure — actually set up a sham Dem primary opponent to Garcia. Garcia is a former director of the Cuban-American National Foundation and an Obama appointee to the department of Energy whom Rivera, naturally, accuses of being a "henchman" for Havana. By late Wednesday, The Herald had a front page story announcing that Rivera and his fake Dem were both the targets of Miami-Dade and federal investigations. Think this is Rivera’s first blush with prosecutorial curiosity? Oh no, my friends, no. Back in 2002, when he was running for the state legislature, Rivera was investigated for personally running a truck full of opposition flyers off the highway so that it couldn’t make its postal deadline. And then there was the mess with the U.S. Agency for International Development. From 2003 to 2009, Rivera claimed his income consisted of his government salary and USAID. Except that when asked, USAID claimed they’d never even heard of him. In the end, though, Rivera amended his financial disclosure, leaving the mystery of his prior claims — they were more like boasts — unresolved. We’ll never know. That $50,000 is still unaccounted for. What we do know is that Rivera mingled personal, government and campaign accounts, lent himself money, transferred a whole lot of cash between himself and family members, and, apparently, didn’t learn any lessons. You&apos;d think with investigations about prior acts still hanging over his head that he&apos;d behave a little differently during his current campagn aganst Garcia. You&apos;d think he might consider that interferring in the Democratic primary might look bad, might get him in trouble, might finally put him in the slammer. Besides just embarrassment, the problem for Rubio is that Rivera’s imaginary (and cachet) career with USAID sounds similar to his imaginary (and very cachet) exile biography. And Rivera’s easy way with personal, campaign and government cash echoes Rubio’s own problems intermingling party and personal finances. This new scandal, which falls right smack in the middle of a viciously personal election, will continue to generate headlines about Rivera, and by defalt about Rubio, for months to come. And for Romney, who prides himself on being personally clean, and whose entire career is based on keen money management, this kind of carelessness would have been more than embarrassing: It would have been humiliating.